By using a specialised dynamic filtration system, the filter element of the SPIRAFILTRE purifier never gets choked. 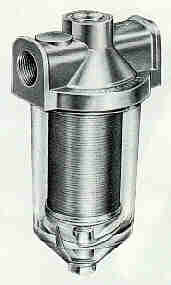 The SPIRAFILTRE system provides a revolution in filtering methods because of its action as a SEPARATOR. It is simple, efficient, strong and has an unchokable permanent element. SPIRAFILTRE products are available in cast aluminium or transparent casings and may be equipped with an integral HEATING RESISTOR. SPIRAFILTRE products are designed to fit within ANY existing installation. STOCKER INDUSTRIE has been manufacturing the SPIRAFILTRE products for over 15 years. SPIRAFILTRE products have been in service for as long as 15 years in light fuel heating installations without needing to be opened once for maintenance. With the SPIRAFILTRE's unique system, paraffins and tars pass through where other filtration systems would immediately get choked especially at low temperatures. By using a properly fitted SPIRAFILTRE within a heavy fuel installation, you can be certain to have a burner operating as easily as with light fuel. The use of asphaltic fuel ultimately results in asphalt gumming which sticks on a traditional filtering unit as the fuel cools off. In addition, a real inconvenience with current filters is their tendency to clog up during the stop periods of the burners. The dirt remaining on the paraffin pellicule sticks in the filtering section by the abnormal pressure created by the pump as it starts up. To address these issues, the SPIRAFILTRE is also available with a fitted HEATING RESISTOR. The efficiency of our standard filter unit has proven superior to other existing systems. And, by adding a heating unit which is immersed in the fuel and is guaranteed sealed (both fuel as well as dielectrically), the SPIRAFILTRE becomes the absolutely indispensable accessory for the burner for heavy fuels. Orifices: up to 400 l/h: 3/8"
up to 600 l/h: 1/2"
up to 1000 l/h: 3/4"
up to 6000 l/h: 1"
Distributors wanted in other countries ! !